Hallyeohaesang National Marine Park (한려해상국립공원) is a national sea park that encompasses the most beautiful stretch of Korea’s south coast, covering parts of Sacheon, Geoje, Tongyeong, Hadong and Namhae of Gyeongnam Province and Yeosu of Jeonnam Province. Its 510,323㎢-wide area covers Dadohae Islets, Bijindo Island and Haegeumgang. The Donam Complex in Tongyeong is being continually developed as a world-class marine tourist attraction. 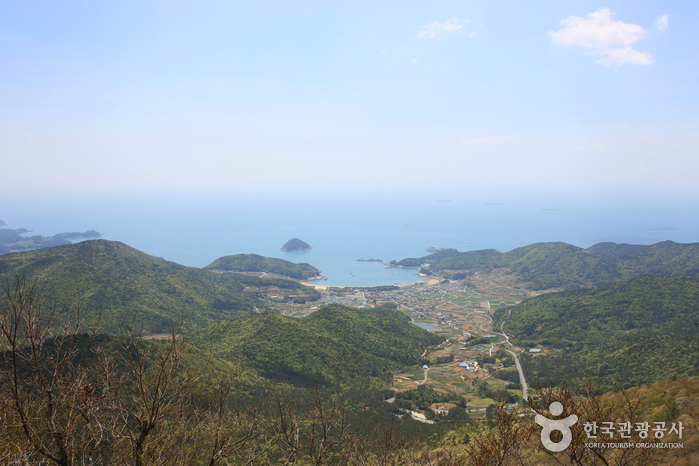 The sea-view of the Namehae section of Hallyeohaesang National Marine Park is particularly breathtaking. Here visitors will be captivated by the view of Sejondo Island, the Pipe Organ Valley and Ssangyonggul Cave. Sangju Beach, at two kilometer-long and 150 meter-wide, is the biggest beach on the south coast and is covered with silver-white sand. The pine forest carpeting the surrounding environment also offers visitors a refreshing atmosphere. Located nearby is 681-meter-high Mt. Geumsan, making the beach a place where vacationers can appreciate both the sea and the mountain at the same time. Other attractions available in this area are the 38 Attractions of Mt. Geumsan, and Irak Shrine (Historic Site No.232) and Chungryeol Shrine (Historic Site No.233) dedicated to the great Admiral Sunsin Yi.